I don’t really have a great excuse for my long absence, but I’m back and hoping to post on fairly regular basis once again, especially since we’re in the middle of the holidays which always gets my mind buzzing with recipes. This recipe is meant to be a riff on something I had at a potluck not that long ago. I wasn’t sure who made what, but there was a salad–similar to this one–that I couldn’t stop thinking about. Of course I didn’t think to ask for the recipe, and now so much time has passed the moment and information are lost forever. So I took a guess, and I think I got pretty close. Cook the rice according to the package directions. You want it tender, but firm. Cool. Blend the mayonnaise with the vinegar and ginger. 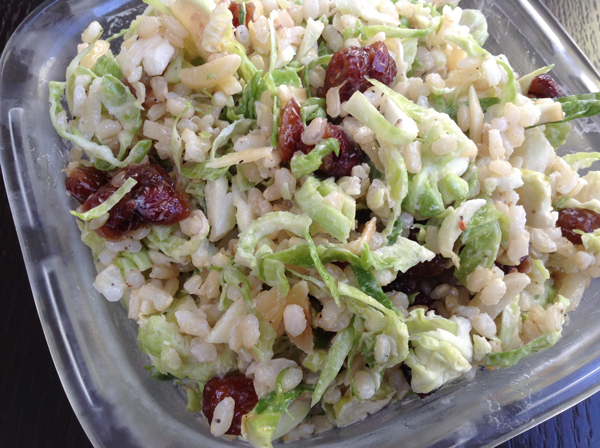 In a medium bowl, toss the rice, sprouts, cranberries and almonds with the mayonnaise mixture. Season to taste.